Song of the day: Hans Poulsen – "Boom Sha La La Lo"
Hans Poulsen is one of the most genial singer-songwriters you’ll ever come across (I always thought of him as very kid-friendly), and “Boom Sha La La Lo” is one big musical smile. The thing I most remember about this song is that it was one of the songs I sang as a nine-year-old at school in the mornings. (I enjoyed primary school – in the mornings we also got to sing “Puff The Magic Dragon” and “Morningtown Ride“.) Maybe that’s why I think of Hans as kid-friendly. 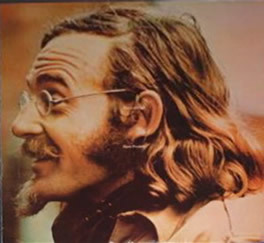 There were two versions of “Boom Sha La La Lo” – the one above was the single version, which is very folky (it’s probably the banjo), and the other version appeared on Hans’ debut album, Natural High (1970). You are currently browsing the archives for the Hans Poulsen category.